Congratulations to Our Outstanding Students in HKDSE Exam 2018! There are 138 students sitting for the HKDSE Exam this year, and they have achieved very pleasing results. Our distinction rate (5* or above) and credit rate (4 or above) in all subjects are at 18.5% and 72.7% respectively. One of our students took Japanese Language as an extra subject and got a grade A in the Cambridge International Examinations (CIE). 84.78% of the students are qualified for JUPAS degree course (3322+2). Congratulations to all S6 graduates who have worked hard for the examination ! Congratulations to Our Outstanding Students in HKDSE Exam 2017! There are 136 students sitting for the HKDSE Exam this year, and they have achieved very pleasing results. Our distinction rate (5* or above) and credit rate (4 or above) in all subjects are at 22.7% and 73.1% respectively. 83.09 % of the students are qualified for JUPAS degree course (3322+2). Congratulations to all S6 graduates who have worked hard for the examination! Congratulations to Our Outstanding Students in HKDSE Exam 2016! There are 145 students sitting for the HKDSE Exam this year, and they have achieved very pleasing results. Our distinction rate (5* or above) and credit rate (4 or above) in all subjects are at 18.2% and 69.6% respectively. 78.6 % of the students are qualified for JUPAS degree course (3322+1). Congratulations to all S6 graduates who have worked hard for the examination! Congratulations to Our Outstanding Students in HKDSE Exam 2015! There are 145 students sitting for the HKDSE Exam this year, and they have achieved very pleasing results. Our distinction rate (5* or above) and credit rate (4 or above) in all subjects are at 22.1% and 71.5% respectively. 83.45 % of the students are qualified for JUPAS degree course (3322+1). Congratulations to all S6 graduates who have worked hard for the examination! Congratulations to Our Outstanding Students in HKDSE Exam 2014! There are 158 students sitting for the HKDSE Exam this year, and they have achieved very pleasing results. Our distinction rate (5* or above) and credit rate (4 or above) in all subjects are at 21.10% and 76.50% respectively. With the distinction rate at 31.0% and credit rate at 92.4%, English Language remains the strongest subject in the school. 87.97% students are qualified for JUPAS degree course (3322+1). Congratulations to all S6 graduates who have worked hard for the examination! Congratulations to Josephians for entering TOP local & overseas universities! Our students did very well in the 2014 HKDSE Examination this year. Over three-quarters of our students got JUPAS offers. Out of the 158 students taking the HKDSE Examination, 48 got offers from HKU, 10 from CUHK and 19 from HKUST. 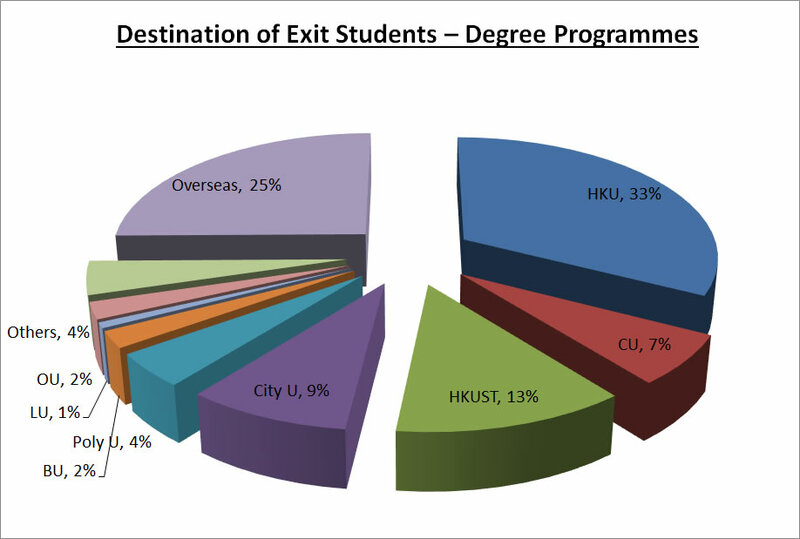 In terms of their faculty choices, 7 students were admitted into the Medical Faculty of HKU and CUHK, 6 into the Law Faculty, 3 to study Actuarial and Quantitative Finance, 1 to study Global Business as well as many others were admitted into faculties of their first choice. Besides going to local universities, many students also received offers from top overseas universities like Imperial College, London School of Economics and University College London. In addition, Chu Ka Hing of 5E got early admission into Imperial College London to study Engineering. Congratulations! The overall percentage of entry to various universities & institutions by Josephians is 85% (135 out of 158). 75% of them accepted the offers from local universities. 25% of them chose to study in overseas universities. Further details are shown in the following chart. 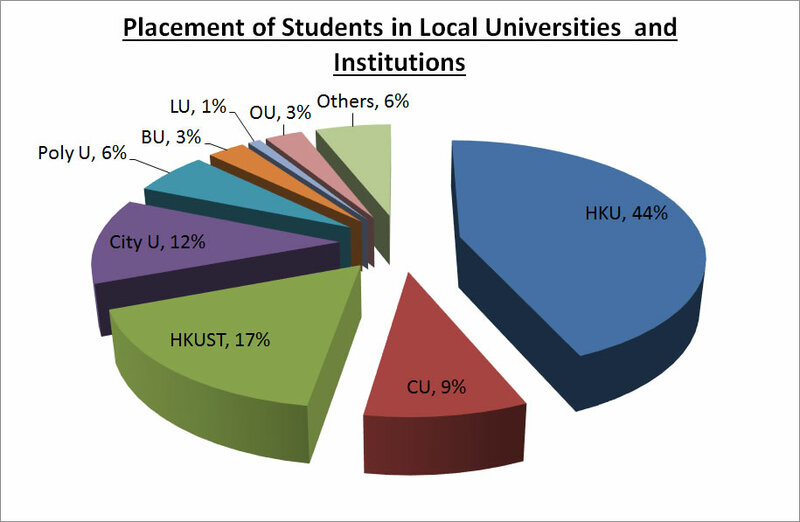 Many of our students are now studying in HKU (44%), whereas HKUST (17%) and City U (12%) rank the 2nd and the 3rd respectively. 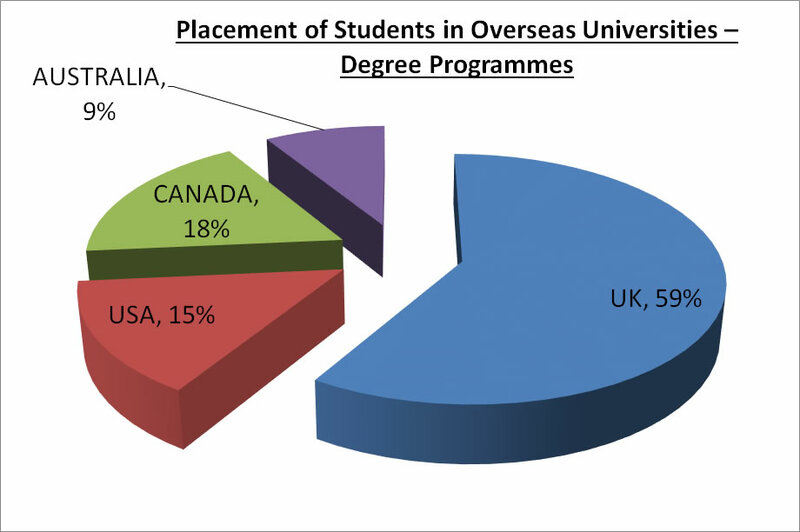 For studying overseas, more than half of the students tended to study in the UK. Canada and the USA were the 2nd and 3rd most preferable choices respectively for the students.